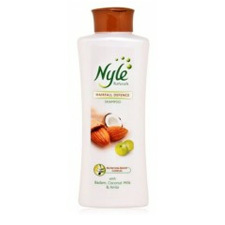 Buy Cavinkare Nyle Naturals Hairfall Defence Shampoo. Hairfall from the roots, breakage from the middle and split ends. Every drop of Nyle Shampoo contains a unique Nutrition-boost complex, filled with the goodness of Badam, Coconut Milk & Amla. Nyle Naturals Hairfall Defence Shampoo works on your scalp, hair and hair tips to fight the three types of Hairloss - Hairfall from the roots, breakage from the middle and split ends. Amla: Amla has minerals that strengthen your hair therepy preventing split ends. Coconut Milk: Coconut milk contains proteins that help prevent hair fall from the root.